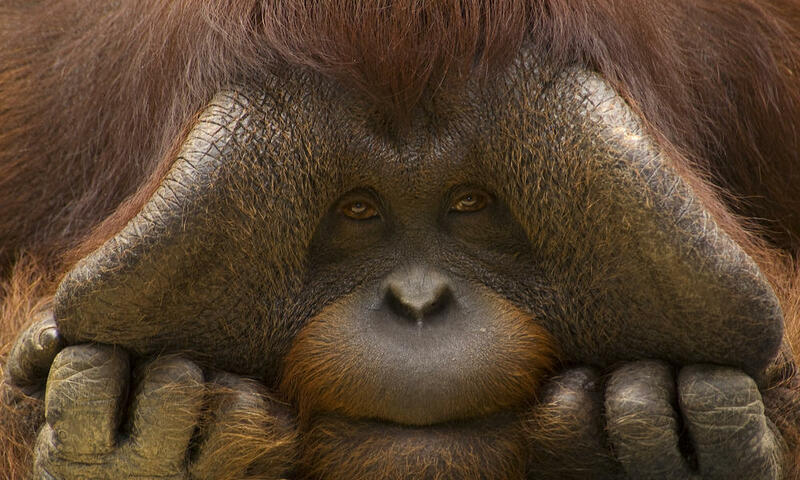 ​Orangutan means 'person of the forest' in the Malay language. ​Orangutans have a characteristic ape-like shape, shaggy reddish fur and grasping hands and feet for climbing. Their powerful arms are stronger and longer than their legs and can reach 2m in length, long enough to touch their ankles when they stand. Orangutans can live up to 50 years in the wild. Orangutans make a nest to sleep in at night, and rest in smaller nests during the day. They are key to forest regeneration by dispersing seeds from fruit onto the forest floor. There are two species of orangutan, the Bornean and Sumatran, which differ a little in appearance and behavior. There are two different types of adult male orangutan: flanged and unflanged. Flanged males have prominent cheek pads called flanges and a throat sac used to make loud verbal long calls. Male Bornean orangutans are largely solitary, only socializing temporarily with females during the mating process. To initiate this process, males send out a “Long Call,” which can be heard up to 3 km away. Females will only be receptive to mating if the male has developed cheekpads, which usually occurs when the male reaches his 20s. Females generally give birth to a single infant after a gestation period of approximately 245 days. Female Bornean orangutans reach maturity between 10 and 15 years old and reproduce every six to eight years on average. Infants remain with their mothers until around 8 years of age. As mothers will not let go of their infants, they are often killed so that their young can be captured for illegal pet trade. Most infants suffer traumatic injuries and extreme distress when they are removed from their mothers. The Bornean orangutan is native to the island of Borneo where it is present in the two Malaysian states of Sabah and Sarawak, as well as in three of the four Indonesian Provinces of Kalimantan. 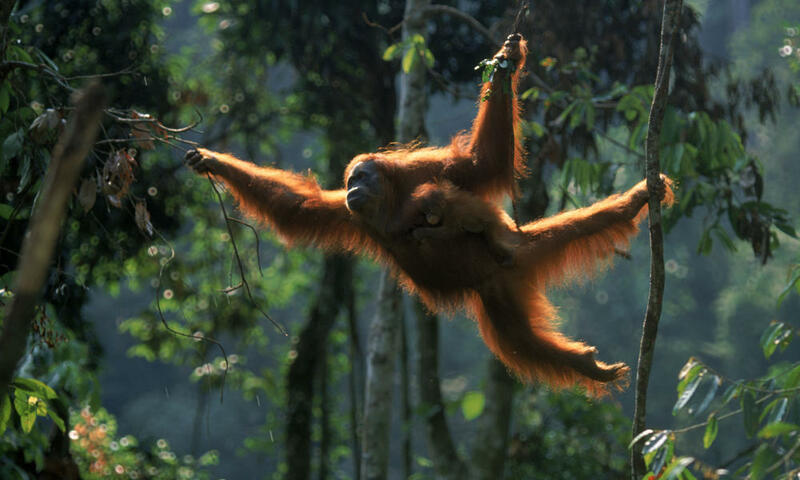 The Bornean orangutan is a fully protected species in both Malaysia and Indonesia. Species distribution is now highly patchy throughout the island. It is estimated that fewer than 60,000 orangutans remain in the wild and the trend is declining. The rapid expansion of oil palm plantations in Borneo in response to international demand has accelerated habitat loss, leaving the orangutan vulnerable to poachers. 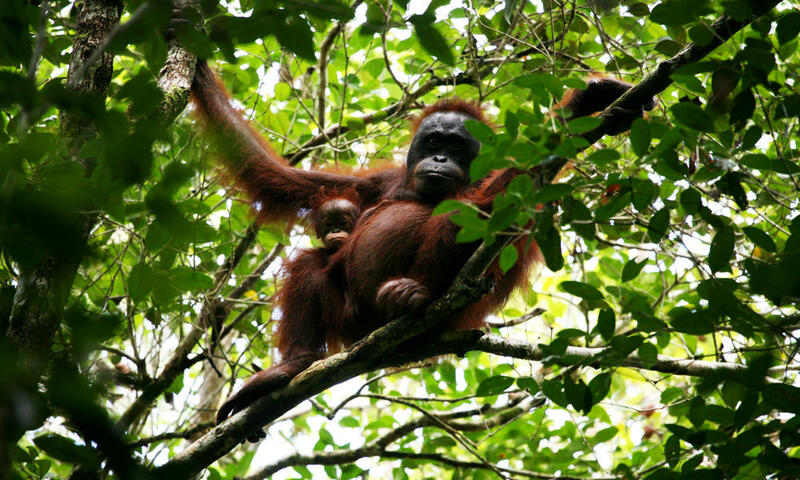 Forest fragmentation further reduces the size of orangutan populations and makes them more prone to genetic drift and inbreeding as well as to local catastrophes, such as floods and fires etc. ​Although some major populations are found within the network of protected areas existing in Borneo, it is now well established that the vast majority of Bornean orangutans live outside protected forests. New mechanisms to ensure their long-term survival outside protected forests are urgently needed. This species is seriously threatened by logging (both legal and illegal), wholesale conversion of forest to agricultural land and oil palm plantations. Animals are also illegally hunted and captured for the international pet trade but this appears to be more a symptom of habitat conversion, as orangutans are killed as pests when they raid fruit crops at the forest edge. Outside of the Leuser Ecosystem there are no other notable large conservation areas harbouring this species. ​Sumatran orangutans have longer facial hair than the Bornean and are also reported to have closer social bonds than their Bornean cousins. Females virtually never travel on the ground and adult males do so only rarely. This is in contrast to Bornean orangutans, especially adult males, which more often descend to the ground. ​With less than 2,500 remaining in the wild. The Sumatran elephant (Elephas maximus sumatranus) is one of three recognized subspecies of the Asian elephant, and native to the Indonesia island of Sumatra. Sumatran elephants are smaller than African elephants with smaller ears and have the highest body point on the head. Females are usually smaller than males, and have short or no tusks. Threatened by habitat loss, degradation and fragmentation, and poaching; over 69% of potential elephant habitat has been lost within the last 25 years. Much of the remaining forest cover is in blocks smaller than 20 feet 250 km2 (97 sq mi), which are too small to contain viable elephant populations. Elephants are often killed by poisoning. Due to habitat loss and lack of food, elephants wander onto plantations and into villages and destroy crops. 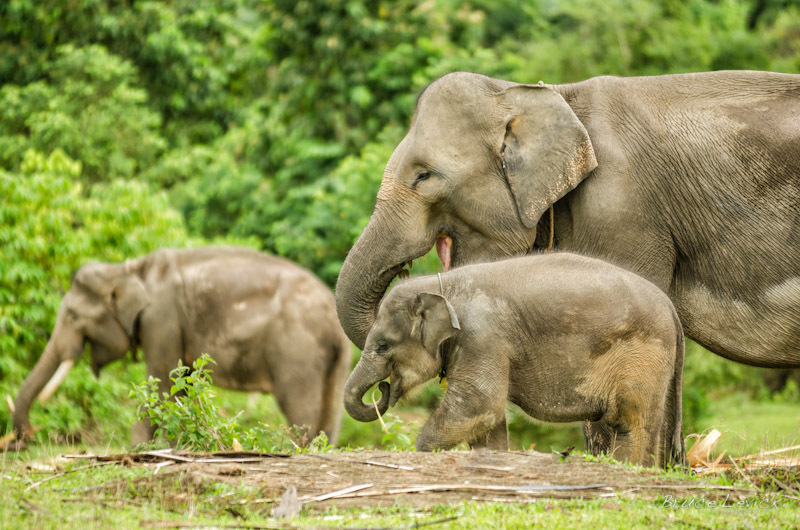 Human, elephant conflict is becoming more common as habitat is cleared for oil palm. Plantations and local villages often poison the elephants and snare traps are also set in the forests near the areas they are encroaching. Tusks of the elephants are often removed to give the impression to authorities that the deaths were due to ivory trade rather than land encroachment. ​The pygmy elephants of Borneo are baby-faced with over sized ears, plump bellies and tails so long they sometimes drag on the ground as they walk. They are also more gentle-natured than their Asian elephant counterparts. 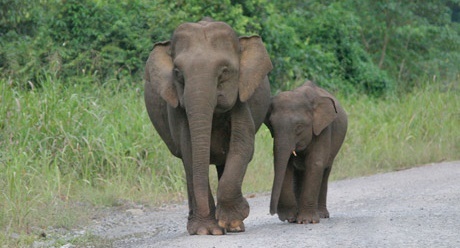 The pygmy elephants of Borneo are the smallest elephants in Asia. There are an estimated 1,000-1,600 individuals left in the wild. The Bornean Elephant is found in the Lower Kinabatangan floodplain in the state of Sabah, Malaysian Borneo and, occasionally, in the Indonesian state of East Kalimantan. Generally they are found in lowland forest, which in the Kinabatangan is seasonally inundated with floodwaters. There are approximately 300 Sumatran tigers existing in the wild. 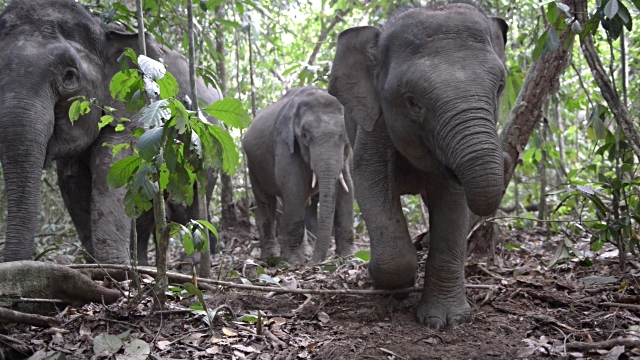 They are holding on for survival in the remaining patches of forests on the island of Sumatra. Accelerating deforestation and rampant poaching mean this noble creature could end up like its extinct Javan and Balinese relatives. They are the smallest of all the tigers, its stripes are narrower than in other tiger subspecies and it has a more bearded and maned appearance. Adult tigers are basically solitary animals that maintain relatively separate territories, however some overlapping occurs in tiger ranges. Cubs are typically born in a secluded area central to the female’s home range. Up to five or six cubs may be born, but more commonly it is two or three. Only one or two cubs from a litter generally survive the first two years of life. Cubs are born blind and depend exclusively upon their mother for nourishment for the next five or six months. 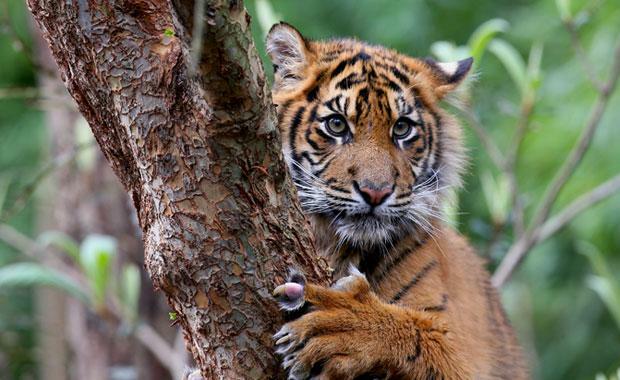 ​The main threat to the Sumatran tiger is habitat loss and poaching. A substantial market remains in Sumatra and the rest of Asia for tiger parts and products. 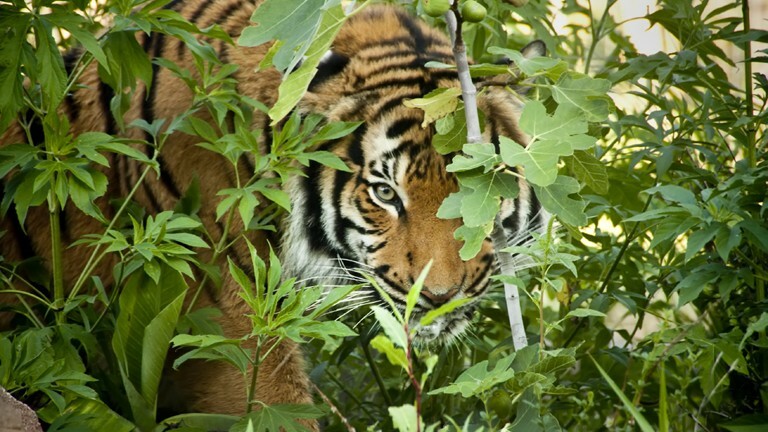 Sumatran tigers are losing their habitat and prey fast, and poaching shows no sign of decline. The Sumatran rhinoceros, also known as hairy rhinoceros or Asian two-horned rhinoceros. The Sumatran rhino is a mostly solitary animal except for courtship and offspring-rearing. It is the most vocal rhino species and also communicates through marking soil with its feet, twisting saplings into patterns, and leaving excrement. Females reach sexual maturity at around 4 years of age, and males are sexually active by around 7 years old. 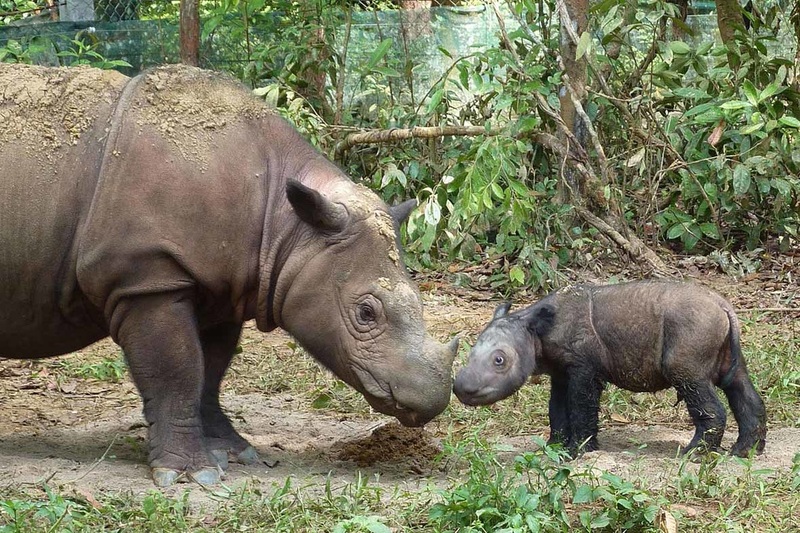 Sumatran rhinos will have a single calf every 4-5 years. They start nibbling from the food hanging from the mother’s mouth at an early age to learn which plants are good to eat, but may continue to suckle up to the age of 13-15 months. The Sumatran rhino lives in dense tropical forest, in both the lowlands and highlands. Sumatran rhinos are very well adapted to life in very dense tropical forests. They are primarily attracted to areas with plentiful food resources. Members of the species once inhabited rainforests, swamps, and cloud forests in India, Bhutan, Bangladesh, Myanmar, Laos, Thailand, Malaysia, Indonesia, and China. In historical times, they lived in southwest China, particularly in Sichuan. They are now critically endangered, with only five substantial populations in the wild: four on Sumatra and one on Borneo. Their numbers are difficult to determine because they are solitary animals that are widely scattered across their range, but they are estimated to number fewer than 100 remaining in the wild. 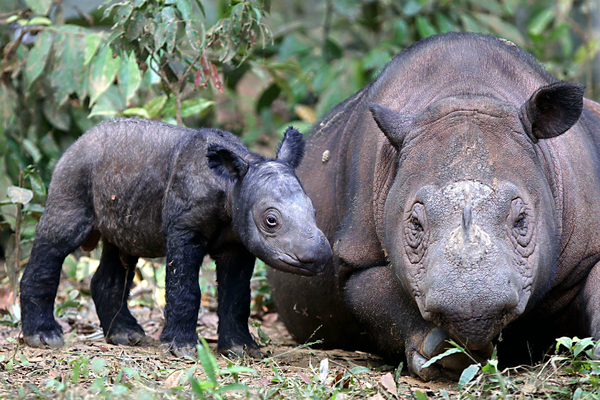 ​The biggest threats for Sumatran rhinos is poaching. Sumatran rhinos are poached for their horn, and the loss of their habitat occurs for human agricultural development leaving them vulnerable to poachers. Over the centuries, the Sumatran rhino had been exterminated over most of its range, though in many places suitable habitat remains. he elusive Sunda Clouded Leopard is found only on the islands of Borneo and Sumatra, and possibly on the Batu Islands. Although thought to exist at relatively low population densities, the Sunda Clouded Leopard appears to be adaptable, and is found in a range of forest types, The Sunda Clouded Leopard is forest dependent. 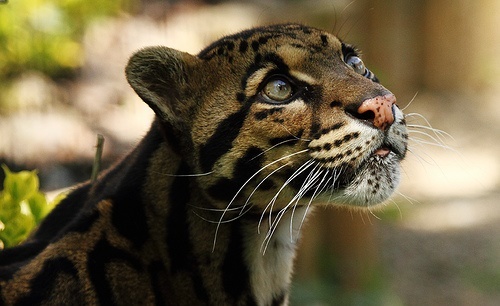 The Sunda clouded leopard is the largest cat in Borneo, and has a stocky build. Its coat is marked with irregularly-shaped, dark-edged ovals which are said to be shaped like clouds, hence its common name. 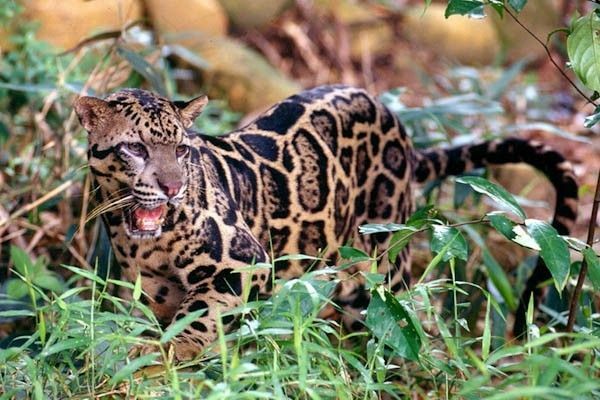 The population status of Sunda clouded leopards in Sumatra and Borneo has been estimated to decrease due to forest loss, forest conversion to oil palm, illegal logging, encroachment, and possibly hunting. In Borneo, forest fires pose an additional threat. It is estimated that fewer than 10,000 remain in the wild. The forests of Borneo and Sumatra are undergoing some of the world’s highest deforestation rates, largely as the result of the expansion of oil palm plantations, and thus such development and consequent loss of habitat, coupled with the species’ apparent low population size, probably constitute the greatest threat to this species. 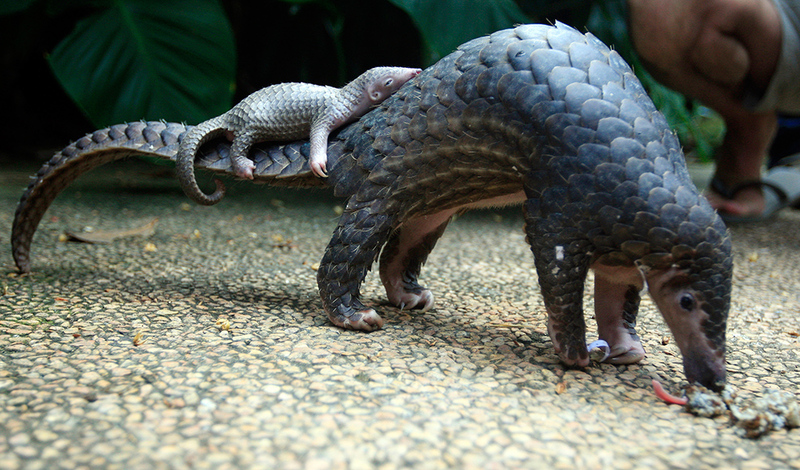 Pangolins or scaly anteaters are a group of unusual mammals with tough, protective keratin scales. Specialised for feeding on ants and termites, they occupy a niche equivalent to that of the American anteaters. 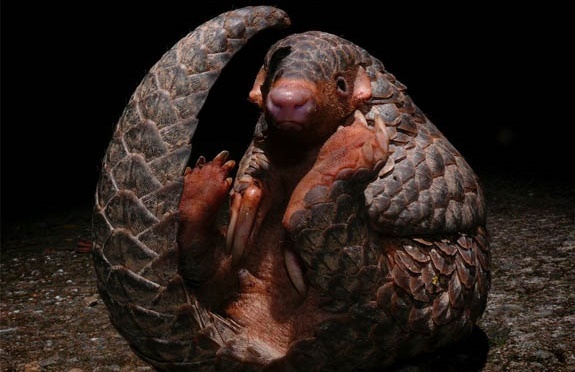 The Sunda pangolin possesses long, powerful claws, for ripping open ant and termite nests, and a long, thin, sticky tongue which can measure up to 40 cm in length, for scooping up its prey. The species is heavily hunted both within China and its other range states, for its meat, which is considered a delicacy, as well as for its skin and scales which are used in traditional Chinese medicine. Found in primary and secondary forest, and in cultivated areas including gardens and plantations, including near human settlements. Habitat destruction and degradation resulting from human activities may also be having a negative impact. Although the species has been reported to occur in secondary forest, evidence suggests that the availability of tree hollows, which is higher in undisturbed forest, is extremely important for this species. ​There is virtually no information available on population levels of any species of Asian pangolin and no comprehensive population estimates. This species is rarely observed, principally because of its increasing rarity, but also because it is secretive, elusive and primarily nocturnal. ​Listed as critically Endangered. 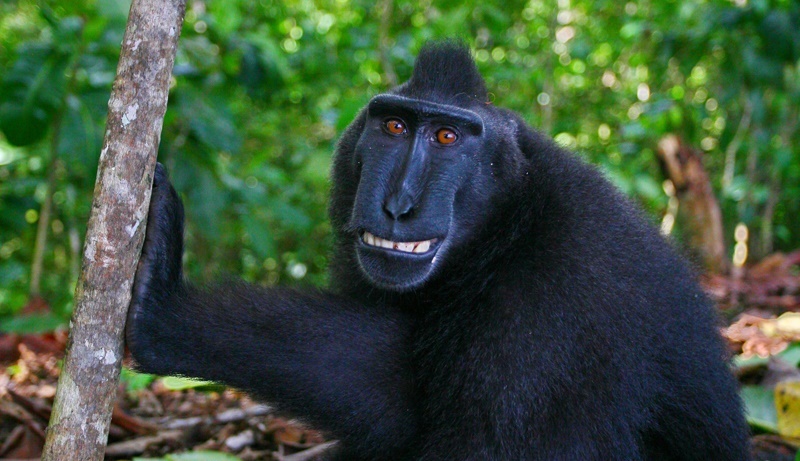 The Celebes Crested Macaque otherwise known as the Crested black Macaque occurs on northeastern Sulawesi, Indonesia and the adjacent islands of Pulau Manadotua and Pulau Talise. On Sulawesi it is found on the northern arm east of the Onggak Dumoga River and Mount Padang to the tip of the peninsula (Groves 2001). There is a sizeable introduced population on Pulau Bacan in the Maluku Islands (Indonesia). With the exception of some white hair in the shoulder, they are entirely jet black. Unusual for a primate, it has striking reddish-brown eyes. The long muzzle with high cheeks and the long hair tuft, or crest, at the top of the head are remarkable features. It has an "apelike" appearance due to its almost non-existent, non-visible tail stub which is only about 2 cm in length. They face high risk of extinction as populations have declined by over 80% in under 40 years due to habitat loss and fragmentation of forests, but also from the bushmeat trade. 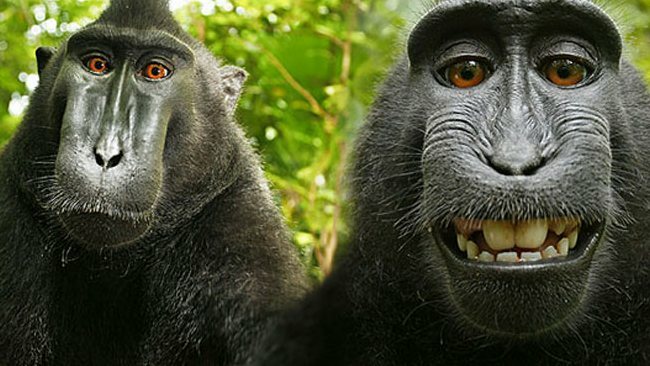 These monkeys are an important flagship species. As with all primates and most large mammals, they are also integral to ecosystem function, stabilizing insect and pest species and playing a key role in forest regeneration through seed dispersal. 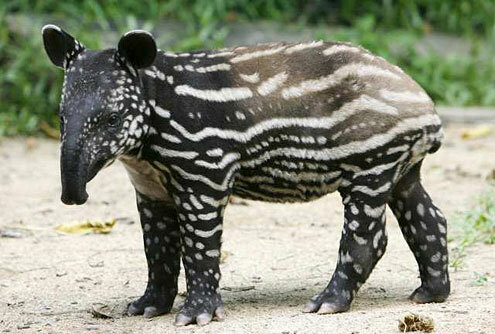 A shy animal that seeks refuge from human encroachment in forest interiors, the Asian tapir is rarely seen. The species eats the twigs and growing tips of a wide range of understorey vegetation, including snapping small to large saplings with its mouth to get to plant parts that are out of reach. It also takes a large variety of fruits and leaves from the forest floor. Individuals are predominantly nocturnal, with most activities taking place at night. However, they are often seen during the day. Having poor eyesight, the animals rely on their acute sense of hearing and smell to find food, detect predators and communicate with one another. 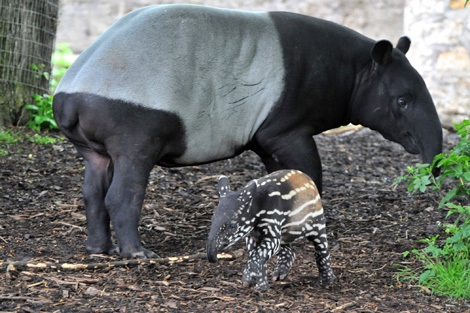 The Asian, or Malayan, tapir is the largest and most evolutionarily distinct of the four living species of tapir. It is also the only surviving Old World species. It is characterised by its long, fleshy, prehensile nose and distinctive black and white colouration which apparently breaks up the outline of the body in the gloom of the forests in which it lives. Formerly ranging across Southeast Asia, the tapir today exists as a series of isolated populations, the largest of which are in Malaysia. This species is listed as Endangered due to an ongoing decline. The last estimate of numbers was in 2008 at 1500-2000 individuals remaining in the wild. Habitat destruction is largely responsible for historical declines of this species, and continues to be the main threat today. Hunting, a relatively minor threat in the past, is also becoming more of a concern; as other preferred prey species are becoming more depleted hunters are increasingly looking towards tapirs as a food source.